A broken heart and the need to find peace compel Eliza Bramble to sign up for a Nordic ski holiday at Baker Creek Lodge, Montana. 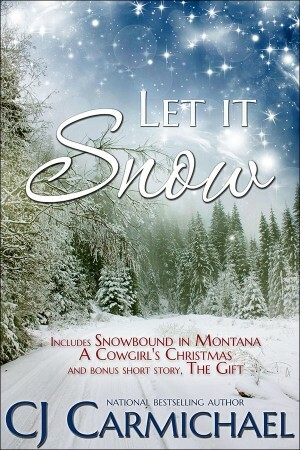 When a blizzard traps Eliza in the remote mountain hideaway, along with rugged ski guide, Marshall McKenzie, and a group of discontented skiers, Christmas looks like a write-off. But Marshall has a special touch with people…and with Eliza in particular. Soon she realizes Marshall isn’t just fixing Christmas—but her broken heart, too. For years Callan Carrigan has been her father’s right hand man, so when her dad’s will names city slicker Court McAlister the new owner of The Circle C Ranch, Callan feels betrayed on every level. Then she and her sisters find their mother’s diaries, hidden from them by their father since their mother’s accidental death 18 years ago, and the shocking revelations explain a lot. When Court offers her a deal—if she agrees to be foreman at the Circle C for one year, he’ll deed fifty percent of the ranch back to her and her sisters—it seems too sweet at first. Until Callan realizes Court has his eyes on something she protects even more than her family’s land—her heart. What would you do if a child in need showed up at your door on Christmas Eve? Amy Gold, Bandit Creek’s kindergarten teacher, is not the sort of person to flout the law. Especially since she’s dating the local deputy, Gray Cassidy. But an unexpected Christmas gift is about to change everything—not just Amy’s plans for a traditional Christmas, but her entire future, and Gray’s as well. For the past few years most of my new books have been available in e-book formats only. Yet I know many of you still prefer to read and own real, physical books. (As do I.) And of course, when it comes to gifting a book, a real book makes a much more satisfying package to open! And so, with the help of my publisher, Tule Publishing Group, I've put together this anthology of three Christmas stories, beautifully packaged to be an addition to your library or a holiday gift.